Thank you to my new friend, Jenn, who reached out after finding my card at the Fleetwood Antique Mall! I was able to help her thin some of her fabulous barware collection and will be able to assist in placing it in new homes. This is exciting for me as she has some great pieces and sets! I am still going through but have started listing. If you know anyone who collects barware or you are thinking about starting, please consider some of these! I have priced mine under my market, but please reach out if you are interested in multiples. Most of these specimens are 30-40's era Art Deco and pre mid century. Here is a look at some! I am the only one with a decent sized set of this pattern as I can tell. The shakers alone are selling for $100 and the ice buckets almost $70. I cannot tell you how adorable it is! The shot glasses are the larger 'double' size. This pattern is very nice, more serious than the animals, but still fun. These shot glasses are also double shot size, ice bucket is a petite 4" tall. I am also hanging on to this! I am all about kitsch and illegal kitsch is even better! 😜👍. Glass decanter with pump, chrome revolving shot glass tray. This decanter is a great piece! Also pre mid century in age. Really cool deco piece. Monarch Aluminum 1937 RITZ shaker features bakelite cap and strainer top. 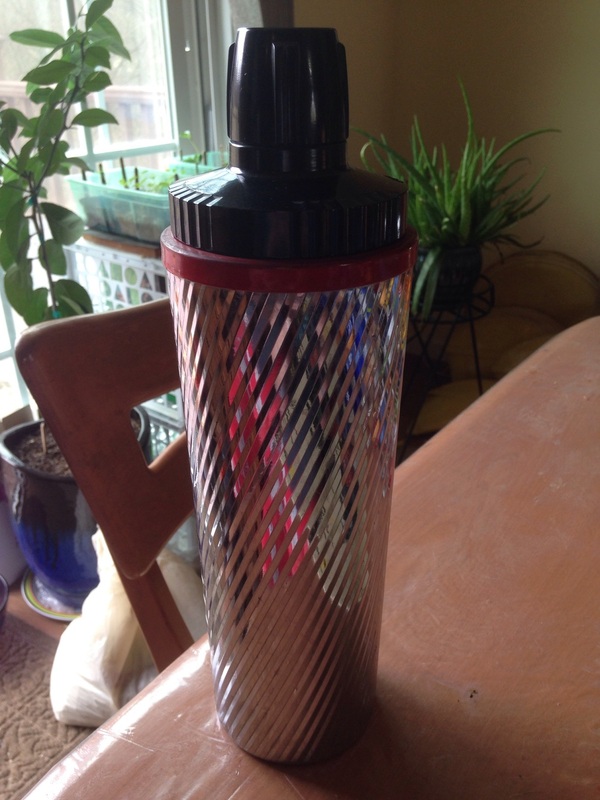 This beautiful shaker is faceted and sparkles! It will make a gorgeous addition to your collection. Complete! I have many individual chrome shakers and the cool cobalt and chrome set. Keep watch on the etsy shop as i get things listed. Reach out if you see something i have not gotten to yet as i have been selling things before i get to list them! 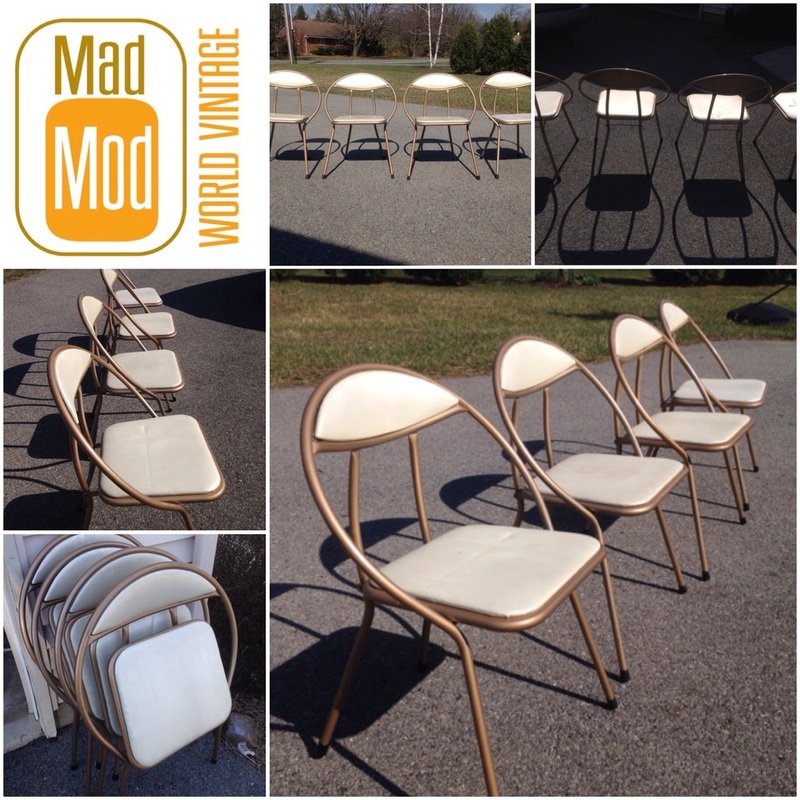 In need of foldong chairs? Check out these! CLARK folding Hoop chair set of 4. Gold with opal vinyl. Clean with minimal wear. So unique! Make sure you check these chairs out if you need temporary seating! They are totally awesome! Will work for everyday chairs in a retro kitchen as well! Don't forget to stop by the booth at Fleetwood Antique Mall today through SAT for 10% off any single item, 20% off multiples at 2R09! I just swapped out the Heywood Chairs and added some new items! The Lane end table just sold on etsy so I left the blond record cabinet! As always, reach out if you plan a visit! Would love to meet you or bring anything you'd like to see! Have a great Easter, if you celebrate!